Is crawlspace conversion a new process? How long has it been used? Crawlspace conversion is not a new process. This valuable construction technique has been in use for more than 60 years. However, most people are not aware of this opportunity to add a new basement under their homes.Over the years, crawlspace conversion has become safer, easier and more affordable. But it still requires a knowledgeable and experienced contractor. This is not a “do it yourself” project. Crawlspaces 2 Basements has extensive experience converting crawlspaces in homes of all types and sizes – from modern ranches to homes on the historical register. Can we dig out the crawlspace ourselves? Crawlspace conversion is a complex process that requires an expert engineer and a knowledgeable contractor. It is not recommended for homeowners to do themselves. It is essential to protect the structural integrity of the home throughout the excavation and construction process. Ted Tapparo and Crawlspaces 2 Basements have been completing top-quality crawlspace conversions for over 10 years. In addition, Ted Tapparo brings more than 30 years in concrete, framing and general construction. Plus, we are fully insured up to $2 million. In summary, you can count on Crawlspaces 2 Basements, and our team of experts, to safely and efficiently create a new basement for your home. How can I be sure this project is safe? Crawlspace conversion has been in use for more than 60 years, and Crawlspaces 2 Basements has completed dozens of projects throughout the Denver Metro area. Our proven construction process is guided by certified structural engineers, who specialize in crawlspace conversion. Crawlspaces 2 Basements partners with StrucSure Home Warranty to provide an outstanding 5-year warranty on all of our crawlspace conversion projects. StrucSure Home Warranty is the nation’s leading warranty provider. Will we need a building permit? Crawlspace conversion is a significant construction project that requires an expert engineer and a knowledgeable contractor. It is essential to get a building permit. Although permits and inspections can be frustrating, these are important steps to ensure the safety of your home and family. Crawlspaces 2 Basements handles everything involved in obtaining a building permit so you don’t have to deal with the hassle of the process. Can you begin work during the winter? What about snow? Crawlspace conversion can be done at any time of year. It’s even a great winter project.Crawlspaces 2 Basements has completed projects in every season. After the initial step of creating our entry hole, the majority of work is done under the house. Adverse weather is rarely a challenge. Do we need to move out during construction? Crawlspace conversion is the most convenient way to add new living space in your home. Unlike additions and pop-top conversions, there is no need to move out. You can live comfortably in your home throughout the construction. This makes crawlspace conversion much easier on family life…and easier to afford. Crawlspaces 2 Basements uses a proven construction process that minimizes disturbance of your living space. The vast majority of work takes place under the house, which is accessed through an exterior entry hole.Crawlspaces 2 Basements is dedicated to helping you and your family to feel comfortable throughout the construction. You’ll be amazed how easy it is to add new living space under your home. How long does it take to complete a crawlspace conversion? Through many years of experience, Crawlspaces 2 Basements has developed a highly efficient process to complete a crawlspace conversion. We’ve learned many ways to minimize downtime and accelerate the construction. Crawlspace conversion is much faster and easier, compared to additions and pop-top conversions, which often last 16-20 weeks and cause major disruptions in the home. Although every project is unique, a crawlspace conversion can often be completed within 6-8 weeks. This represents the time from starting the job to the completion of all concrete work. At that point, you can finish the basement right away or wait until later. It’s your choice. Will my utilities (water, electric, gas) be turned off? Completing a crawlspace conversion is a very convenient way to add new living space in your home. However, during construction it is often necessary to relocate gas, electric and water lines. This brief interruption of utilities rarely lasts more than a few hours. Everyone at Crawlspaces 2 Basements is committed to helping you and your family live comfortably in your home throughout the construction process. How do you get underneath my home to start construction? Crawlspaces 2 Basements uses a proven, engineering-based construction process. We begin by digging an entry hole into the crawlspace, through your existing foundation wall. Then, all work access is made through the entry hole and this is where all the dirt exits from your crawlspace. There is typically no activity in your living space. For your safety and security, the entry hole secured at night and weekends. Through our extensive experience, Crawlspaces 2 Basements has learned how to create a new basement quickly and efficiently, with minimum disturbance to your home. Do you also offer basement finishing? 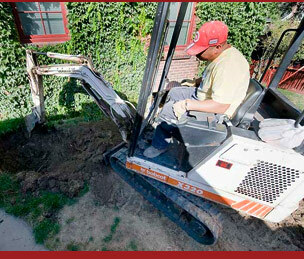 Crawlspaces 2 Basements specializes in the “heavy lifting” work of crawlspace conversion. We are experts in excavation, structural reinforcement, concrete and framing. Our proven experience and specialization ensure that Crawlspaces 2 Basements delivers the maximum return on your investment. Our unique approach provides maximum flexibility for “when” and “how” to finish your new basement. Some homeowners want their basement unfinished. Some want simple finishes, while others prefer luxury. Crawlspaces 2 Basements works closely with outstanding finish contractors throughout the Denver Metro area. This means we can recommend a contractor to meet your specific needs and requirements. How can I learn more about the construction process? You can start by exploring our project portfolio to see step-by-step slideshows of some of our recent projects. You can also contact Crawlspaces 2 Basements at 303.598.9988 to schedule an appointment. At that time, we can thoroughly explain the construction process and discuss your specific requirements. It is also possible to visit one of our current conversion projects. Another way to learn about our work is to hear directly from our customers. Click on the video below to hear about their experience with Crawlspaces 2 Basements.